Today I want to invite you to take the next step in your ministry and church growth by joining my Senior Pastor Coaching Network. What if your church could double in attendance over the next year and so could your personal effectiveness? You could consistently get everything done at the office, easily manage your staff and volunteers, and still get home on time for dinner and family fun each night? These are typical results I've seen in hundreds of pastors who have completed my coaching process. There is no conference, seminary class, set of conferences or coaching process offered by any other organization, church leader or denomination that is as proven as my coaching process. I'm not teaching you theory or stuff that I've only read about. I'm coaching you as a fellow practitioner who is in the trenches day after day leading a growing church in one of the most difficult cities in the world. In addition, the coaching process that I will lead you through is a proven process that has been effective with over 2,000 churches from 60 diverse denominations and in small and large cities. And there's a lot of trouble, transition and tension in our country. Are you ready for the lost and broken people that God wants to send your way so that they can become fully devoted followers? Are you willing to get ready to lead at a high level? The truth is, all growing churches are led by growing leaders! For the last two decades, I've been asking, "Why do some churches grow and others do not?" There is only one commonality among all growing churches: they are led by growing leaders. Through my coaching networks, I've personally coached more than 2,000 pastors — from American Baptists to Pentecostal Holiness to United Methodists (and every denomination in between) — who have made a serious commitment to grow. And God has honored their personal commitment to growth by allowing them to see evangelistic growth. Are you preparing for God to bless your church? 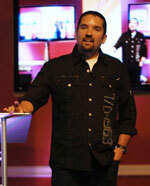 "I have been challenged to go beyond what I ever thought possible for me and my church. Nelson has provided practical teaching, examples, tools, principles...everything I need to excel in the areas of stewardship, small groups, evangelism, assimilation and many other areas of church life. I'm looking forward to a second round." Is it possible that you are facing one or more growth barriers or system constraints in your church? You see, the wrong question to ask when we want to grow a church and reach people is, "How do I get my church to grow?" This will lead to wrong answers every time. The right question to ask when we want to lead our church to the next level is, "What is keeping my church from growing?" There could very well be one particular constraint or barrier that if removed could allow your church to start growing immediately! You are invited to be a part an elite group of Senior Pastors that I will train in personal and church growth over the next year. This coaching network is not for everyone. It is only for those pastors who are serious about leading their church to its full redemptive potential. Those pastors who are serious about being "stretched" in their thinking and leadership. This network is for those who are willing to take action and make a commitment to fully participate. I'm not looking for "lukewarm" commitments. Instead of flying to my office, each month you will join in this coaching network via your computer. As I'm coaching you, you will log on to your coaching hub where you can see my notes and coaching assignments. In other words, you will experience the same coaching that others have experienced while SAVING THOUSANDS of dollars in travel costs and SAVING DOZENS OF HOURS on cross-country flights. Unlike other Coaching Networks, You Get FREE Resources! I will share every church growth and personal development principle I know and give you every resource I've developed to help you implement each principle. Don't worry, it will not be overwhelming...everything will be delivered in manageable bits over the course of the year. Over $4,166.70 in FREE resources from Church Leader Insights (including all 8 systems seminars) PLUS special discounts on any new resources. Plus much, much more! As you can see, just the tangible benefits you will receive as part of this network will far out-weigh your monthly financial investment. In addition to our monthly coaching session, you will receive the recording for one of my exclusive church growth resources and a hand-selected book, plus another book (generally, a business book with clear application to ministry). While this network will stretch you to grow, study and read, it will not be overwhelming. I'll help you prioritize so you can maximize your effectiveness as a Pastor. At the same time, there will be opportunities for you to share your ideas and learnings from the network, plus you'll be able to submit prayer requests and ask questions to me and everyone else in the network. Each network session is 75 minutes. I want to make sure that we fully cover all eight Church Systems and each of the nine Growth Barriers from my books and resources. PLUS, you’ll receive a “Coaching Blueprint” that gives you specific next steps. There are “Getting Started” next steps that will help you implement the very basics of the system, an “Intermediate Blueprint” that will guide you to implement beyond the basics, and for Coaching Alumni there is an “Accelerated Blueprint” that will help you go even further with each system! Led by Nelson, this network is based on the 8 Systems of a Healthy Church that he has identifi­ed and taught to thousands of churches, through books, resources and live events. You’ll receive monthly sessions over the course of this network that you can fully participate in anytime. And unlike other networks, you’ll receive both the audio and video. The Senior Pastor Coaching Network is normally $397.00 a month, but you can lock in the lowest rate available: just $397 a month for the full network. This includes FREE access to over $2,653.55 in bonus resources, including all eight Systems Seminars! Get started today! I strongly encourage you to make every monthly coaching module, but I also know that ministry is messy and uncertain, so I will record every session and you will receive an archive of every session in your hub. Plus, every month you will receive resources and materials to help you implement what you are learning. 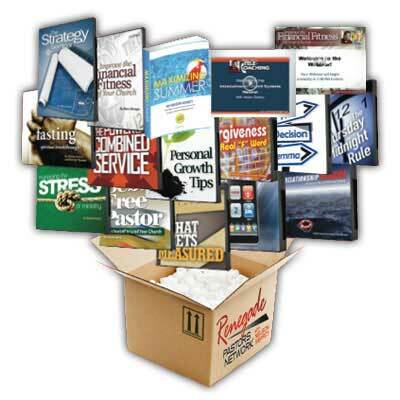 You will have a complete Church Growth Library at your fingertips! "The month we started our first coaching lesson we averaged 280 people. This month we averaged 360, and that does not include Easter Sunday, in which we had 480. I have been to great meetings where I was motivated to come home and grow our people and our church. This network for me feels like I am learning how to be a quarterback on a Super Bowl team, not from a loud, emotional, motivated coach, but from a successful NFL quarterback." 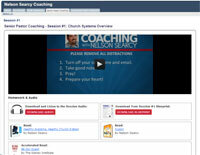 Join the Senior Pastor Coaching Network and receive over $2,653.55 in additional bonus resources! Select your current (or any previous coaching session). 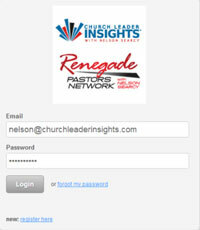 You will receive access to BOTH the Senior Pastor Coaching Network and the Renegade Pastors Network! Yes Nelson, I'm ready to join the NEW online Senior Pastor Coaching Network for the lowest rate available - only $397 a month! I'm ready to join the Monthly Online Senior Pastor Coaching Network - locking in my $397/month rate AND immediately receive FREE membership in the Renegade Pastors Network ($1,188.00 value) with the $813.20 in immediate bonuses! Your credit card will be charged $397 today and on the 1st of every month for each monthly coaching session. Only submit the form once, otherwise more than one subscription may be charged to your account. Your statement will show the charge from the Nelson Searcy Company. Your Online Senior Coaching Network and Renegade Pastors membership subscription is for ONE church. Please do not distribute these resources to any other church, organization, or individual. All materials are protected by federal copyright laws and cannot be distributed or reproduced without written consent.